Very Good. 2000. Paperback. Good clean copy with some minor shelf wear.....We ship daily from our warehouse. Very Good. Memories of the Great and the Good by Cooke, Alistair. Trade paperback (US). Glued binding. 296 p. Contains: Illustrations. Very Good. 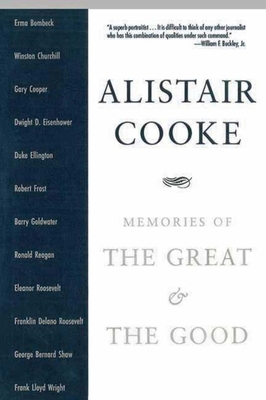 Memories of the Great and Good by Cooke, Alistair, 1999-07-01. Sewn binding. Cloth over boards. With dust jacket. 288 p.
Good. Memories of the Great and the Good by Cooke, Alistair. Trade paperback (US). Glued binding. 296 p. Contains: Illustrations. Good. 1559704799 Good condition ex-library book with usual library markings and stickers.